Girls see these defined roles they’re supposed to follow in life, but when I was a young child, my parents told me I could be anything. For me the challenge isn’t to be different but to be consistent. Disharmony is natural in any band. Anyone who wants to know who I am can just read my lyrics – I’ve always written about who I am. A lot of the songs I’ve recorded are songs I write. A lot of people ask me why I don’t expand and explore other musical areas, but I like the plain three- and four-chord rock-and-roll that I call the the semi-blues. I want to be singing to everybody, and I want everybody to think that I’m singing to them. Guys, girls and everyone in between. I think it’s important to have mystique. I leave for the show at least an hour ahead, and I do some vocal warm-I like the way black looks. I think I look better in darker clothes. And maybe the fact that I wear black so much makes me more aware of putting people at ease. The black is sort of the bad-guy guise, so I work overtime to make people comfortable. I leave for the show at least an hour ahead, and I do some vocal warm-ups, and that’s pretty much it. I have a tough time judging myself. I don’t like to say where I’ll be in 10 years. I don’t know if I get recognized necessarily, though I do get looked at a lot – but I don’t know if it’s because of who I am, or if people just think I look weird. 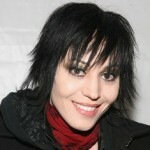 Joan Marie Larkin, known professionally as Joan Jett was born in Pennsylvania, USA. She is an American rock singer, songwriter, Guitarist and occasional actress. She is best known for her work as the frontwoman of her band, Joan Jett & the Blackhearts, preceded by success with the Runaways, including the hit song "Cherry Bomb". The Blackhearts' song "I Love Rock 'n Roll" was number one on the Billboard Hot 100 from March 20 to May 1, 1982. Her other popular recordings include "Bad Reputation", "Do You Wanna Touch Me (Oh Yeah)", "Light of Day", and "I Hate Myself for Loving You". She has three albums that have been certified Platinum or Gold, and has been a feminist icon throughout her career. Her albums list shown below: Joan Jett, Bad Reputation, and The Hit List. Her role in several films include: Light of Day, Boogie Boy, By Hook or by Crook, The Sweet Life, Endless Bummer, Lock and Roll Forever, Multiple Sarcasms, and Big Driver. She is also known as the Godmother of Punk. In 2015, she was inducted into the Rock and Roll Hall of Fame.